Ashland showed that almost anything can be turned into art with an unveiling this week of the town’s first 100 percent recycled-content public art mosaic. Garbage and recycling company Recology Ashland Sanitary Service commissioned Ashland artist Sue Springer to create the ground-level mosaic near the North Mountain Park Nature Center on North Mountain Avenue. 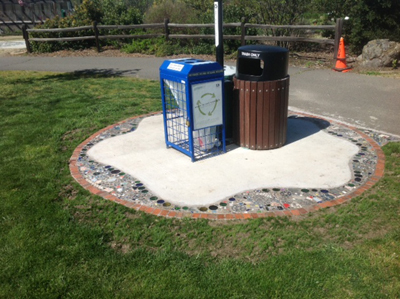 The mosaic encircles a concrete pad, which itself supports a regular trash can and recycling containers for glass, plastic bottles and aluminum cans. The mosaic includes salvaged bricks, glass bottle bottoms, bottle caps, jewelry, bicycle chains and gears, cut up credit cards, keys, broken tiles and dozens of other objects. Springer said creating the mosaic got her thinking about how to reuse recyclables, rather than just tossing them into recycle bins to be trucked away. “It’s really changed how I think about recycling,” she said. The idea for the recycled content mural was born when Recology Zero Waste Specialist Risa Buck was talking with Linda Chesney, stewardship coordinator for the Ashland Parks and Recreation Department, about the need to revitalize North Mountain Park’s trash and recycling collection station. Previously, garbage and recycling containers had been placed next to drab green electric utility boxes, where they didn’t stand out well. Putting the containers atop the new mosaic makes them more noticeable, and also gets people thinking about garbage and recycling, Buck said. “People can come and see it’s only trash if that’s how you treat it,” she said. Two-year-old Wesley Koning of Ashland was enjoying the mosaic earlier this week, pointing out different objects to his mom, Rachel Koning. “There’s a key. What number’s on it?” Rachel Koning asked her son. Rachel Koning said she thinks the mosaic is a great addition to the park.